Select one of the items at left to see a full sample menu. These represent just a sampling of our food style. Many more options are available including vegetarian, a large selection of fresh seafood and game meats and birds. 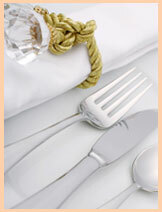 We also offer ethnic-inspired menus featuring Tapas, Mediterranean, French, Asian, Latin, Cajun and Caribbean cuisines. Sit down dinner menus are custom designed for each client. Each menu we design always keeps in mind the season and the availability of the freshest produce, fish and meat. We will gladly design a menu to fit within your budget. Dinners can range from a simple buffet with an impeccably fresh baby green salad and a hearty satisfying pasta, to an elaborate and beautifully plated multi-course sit down meal with formal service. We will be delighted to create a menu for your special event uniquely suited to your tastes and budget.